After releasing high-end Galaxy Note 8 smartphone, Samsung has revealed a brand new Gear VR headset which is designed to support the Note 8 and its 6.3-inch display, it's lighter and more comfortable. No doubt, Samsung Galaxy Note 8 and the new Samsung Gear VR are the best partners. Just simply place your Galaxy Note 8 into the Gear VR headset to explore multi-dimensional worlds in virtual reality. In this article, we will not highlight the features of Gear VR and Galaxy Note 8, but the way on how to rip DVD for watching 3D movies on Gear VR via Galaxy Note 8. Read on to find out more. Playing DVD on Samsung Note 8 With Gear VR is a cool thing, you can enjoy the 3D movie on the way, on the trip, on the bus, on the train, etc. The following part will show you how to achieve that. What you need to prepare for watch DVD movies on Gear VR? As Samsung Gear VR compatible smartphone Galaxy Note 8, S8, S8+, S7, S7 Edge, etc are using the Android operating system, therefore, what you need to do is downloading and installing the free VR video players for Android such as VR Player, AAA VR Cinema app, Homido 360 VR Player, VR Gesture Player, VRTV Player, etc on those smartphones for viewing 2D/3D movies on Samsung Gear VR. Actually, Samsung Galaxy Note 8 lacks the ability to play DVD movies. In addition, the commercial DVD discs are protected to prevent users from copying DVD contents. On this occasion, you just need a powerful VR Video Converter to help you to watch DVD on Gear VR from Galaxy Note 8 with 3D effect. Here, a combo function of splendid 3D VR Movie Converter - Pavtube Video Converter Ultimate is highly recommended to you. With the program, you can comprehensively convert 3D movie with various different file formats and also standard DVD, 2D/3D Blu-ray movies with copy protection and region code to Galaxy Note 8 VR video player compatible Anaglyph 3D video, Side By Side 3D video, Top and Bottom 3D video. If you don't satisfy with the output 3D video effect, you can adjust the output 3D depth value to get better 3D depth perception. In addition, you can also use the "Switch Left Right" option to change the image display order for 3D SBS movie. For Mac user, you can own the Mac version (mac OS High Sierra). Install and launch the best DVD to Gear VR Converter, click “Load disc” button to load your DVD disc to this program. Here, DVD Folder, DVD IFO File, DVD ISO Image File are supported as well. Tap on "Format" bar and find "3D Video", there are a lot of format options for you. 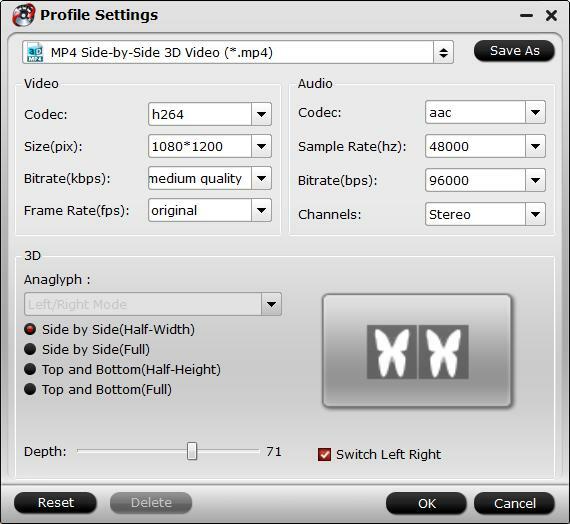 You can choose one of Gear VR compatible 3D formats such as "MP4 Side-by-Side 3D Video (*.mp4)" according to the VR player you are using. 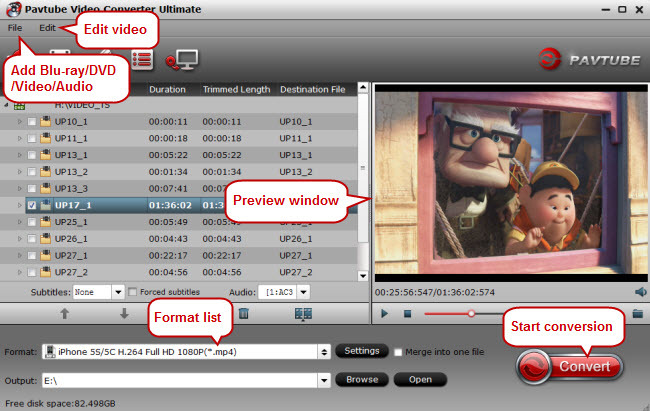 With all settings, tap the "Convert" button to convert DVD to 3D video conversion. Once finished, click "Open" bar to quickly locate the converted 3D video from the output folder, then transfer them to Galaxy Note 8 with ease.